That elusive GDrive file storage service we have been waiting on since the dawn of Gmail, and before Android was even a twinkle in Andy Rubin's eyes, might apparently launch as soon as next week, insiders have confirmed. A leaked screenshot from testers shows 5GB of free Google Drive storage with the option to upgrade for a fee, and upcoming mobile apps. You can, of course, bet the house that Android users will get the free cloud storage, as rival iOS already has given 5GB for free with iCloud. Google Drive will also have the ability to "make changes to a file in one place, and it automatically updates everywhere". That also seems to be the moto of the service - "All your files - everywhere". How exactly will Google Drive be tied into the existing services like Gmail with its 7GB+ allowance, Picasa and Google Docs with 1GB and so on, remains to be seen, but it shouldn't be a long wait, since sources inside Google have indicated an official announcement as soon as the first week of April. I also i hope there is no cap on file size for upload. 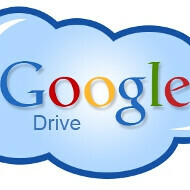 I wonder if Google Drive will be DMCA compliant much like DropBox. I really need a place to offload my...*ahem* films and shows that I have obtained from improper channels. Google should at least try to match SkyDrive's free 25GB limit. Take 5Gb from my gmail, add it to gdrive and I'll use it. Interesting news that Google is offering 5 GB of online storage which comparatively less with what Box is offering 50GB for android users. Meanwhile found some interesting tools for cloud storage. Tools such as CollateBoxhttp://www.collatebox.com/ are very promising, went through their blogshttp://blog.collatebox.com they are edifying.